The Astrological New Year and the Thai Lunar Calender Thailand’s Songkran Festival is by far the most important event of the year for the Thai people. It’s a time of fun and a special time for new year ritual and respect for water, the most important element in the agricultural culture of Southeast Asia. Songkran falls in mid-April every year and has its origins in ancient astrology and the position of the sun. The term Songkran itself means, ”a move or change in the position of the sun from Aries to Taurus,” it falls sometime between April 10 and April 18 and in Thai tradition it includes the celebration of the end of one year — ‘Troot’ — and the beginning of a new year – ‘Songkran’. The phases of the moon and the lunar calendar also play an important role in determining the Thai New Year. Thus, the Thai New Year is a product of astrological as well as lunar features according, to the old Thai lunar calendar. 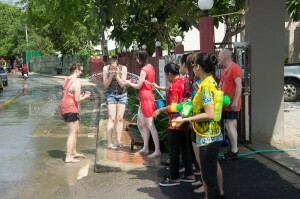 Songkran is celebrated all over Thailand. In Kanchanaburi, it is held on April 17.